SIS LIVE: Ultra HD (4K) video via satellite uplink transmission. Milton Keynes, UK, 6th September 2013, Satellite connectivity expert SIS LIVE has been working with Sky to explore and develop the technology used to transmit ultra HD (4K) video via satellite. The project kicked off on 22nd August with Ultra HD transmissions from High Wycombe to Sky’s Osterley base. 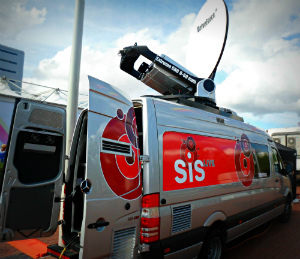 As the market leader in satellite connectivity and a preferred supplier of Sky, SIS LIVE was perfectly placed to handle the transmission of these innovative UK broadcasts, assigning to the project SIS 67, one of its new fully redundant, dual path uplink units. 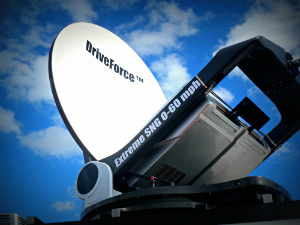 SIS 67 features the innovative 1.8m DriveForce vehicle mounted antenna which was designed and manufactured by SIS LIVE’s in-house engineering team. Aside from four 4K encoders fitted especially for this project all other equipment was already installed in the vehicle. The tests successfully illuminated 72MHz of satellite space transmitting at 70dBW on Ku Band via the Eutelsat 3D satellite 4 carriers were multiplexed into 1 transport stream and transmitted at 140MB of data per second. The signal was downlinked at Sky’s facility at Osterley where it was viewed live on an ultra HD screen and recorded onto servers. The same technical configuration was then recreated at the Premiership Games between Cardiff City and Manchester City on 25th August and at West Ham versus Stoke City on 31st August, in the process proving that live 4K content can be effectively transmitted and received. SIS LIVE’s innovation here has supported Sky’s continuing mission to offer its customers the ultimate viewing experience technology can afford.